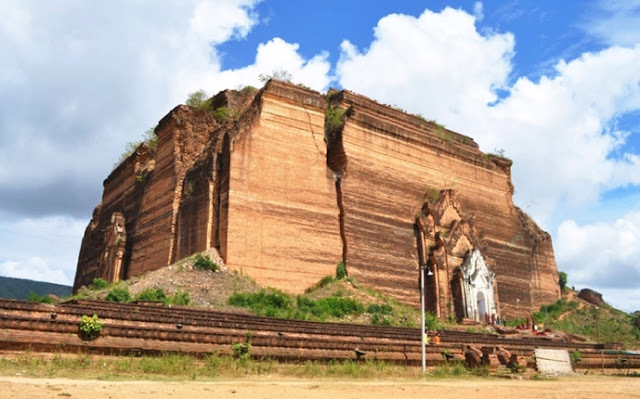 Mingun is best known for its gigantic, unfinished stupa, the Mingun Pahtodawgyi, which was meant to be the largest in the world (at a projected height of 150 metres), but now lies ravaged by earthquakes on the western banks of the Irrawaddy. The structure is an impressive sight, and there are panoramic views from the top. Although there are signs telling you not to climb the stairs due to the damage and cracks, locals rarely stop visitors doing so and sometimes encourage it; as with all pagodas, shoes must be removed and children will sometimes offer leaves to step on in order to protect your feet from the intense heat. A model of what the stupa was meant to look like had it been finished, called the Pondaw Paya, can also be found nearby. What is said to be the largest uncracked, ringing bell in the world, the 90-tonne Mingun Bell (with a diameter of almost 5 metres) was cast to go in the Mingun Pahtodawgyi, and holds pride of place nearby. 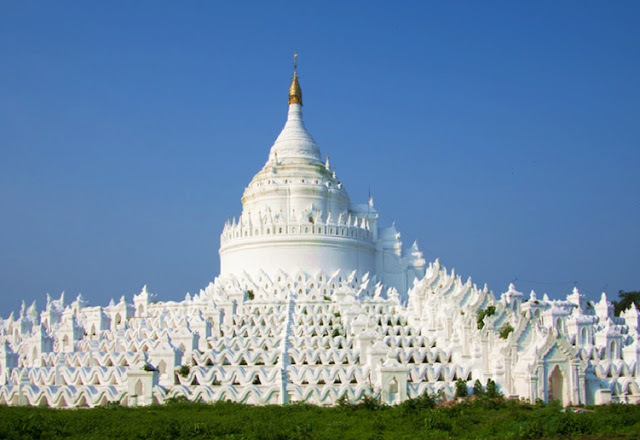 A few minutes walk to the north of the bell can be found the Hsinbyume (Myatheindan) Pagoda, a white pagoda that is quite different in design and style from most pagodas in Myanmar. It is named after a princess who died in childbirth, and was built in 1816 and restored in 1874, after suffering earthquake damage. *Mingun will truly leave you enchanted!